The latest geotechnical data shows that is feasible. It had become the preferred site during the site masterplan process which was concluded late last year. At that time there was some outstanding geotechnical uncertainty which has since been resolved. Health Minister David Clark has announced that the outpatient and day surgery building will be fast-tracked to relieve pressure on the existing hospital. It is scheduled for completion in two stages – November 2023 and November 2024 – with the day surgery facility being fully operational in November 2023. Mr Hodgson said that the site masterplan allows for the retention of the historic Cadbury dairy factory, but not the street facade beyond that. “It now seems likely that we will successfully retain the old dairy building. Everyone wants that, and we have enough room without having to push the hospital to dizzy heights. 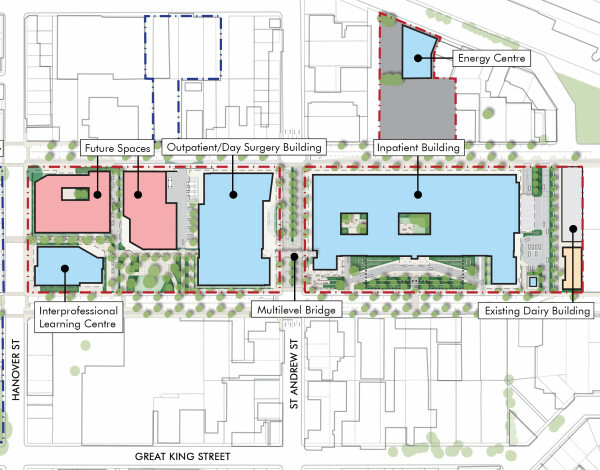 “The so-called ‘future’ parts of the site plan allow for both expansion and relocation. A good example is the southern blood and cancer service which will remain on its current site, probably until the linear accelerators used for radiotherapy come up for replacement. If you have any questions about the New Dunedin Hospital Redevelopment please contact us. We appreciate there will be many providers of professional and construction services who will be interested in becoming involved in the New Dunedin Hospital. Click here for more information.